I recently had a bit of a lazy day, and combined with the crappy weather outside, I put on a few favourite films to help pass the afternoon. One in particular (and I'll get to which one later) got me thinking about memorable death scenes in sci-if films. Not just spectacular or gory special effect laden deaths, but more those with certain relevance to the film, or emotionally stirring scenes. I've compiled my own personal top 5 scenes, some of which are iconic, some of which, dear reader, you might not know, or had ever considered. Please feel free to list your own in the comments. Anyone who knows me will be aware of my absolute devotion to The Big Lebowski. I am in fact an ordained priest of The Church Of The Latter Day Dude. Jeff Bridges almost, but not quite resurrects The Dude to reprise Kevin Flynn from the original Tron film (1982). Flynn has to sacrifice himself, to allow his son to escape The Grid, and to stop Clu (a rather poorly digitally rendered young Kevin Flynn) taking his army in to the real world. Bridges channels a zen like Dude character, knowing what he has to do, and what must be done. A heroic death. And for anyone who is a big Jeff Bridges/Lebowski fan, quite moving! 4. Gattaca (1997) The Death Of Jerome Eugene Morrow. Gattaca, in my personal opinion, is a vastly underrated film. A noir detective thriller, which whilst set in a near-dystopian landscape, has the set design, costuming, and retro-futuristic 1950s/60s styling. Vincent (Ethan Hawke) is 'borrowing' the genetic code of Jerome (Jude Law), when the evidence in a murder case makes Vincent a suspect. I don't want to go in to too much detail, in case you have never seen it, and I would not want to spoil such a classy, stylish, and intelligent a sci-if thriller. But *SPOILERS* I do have to mention the moving suicide of Jerome. Wheelchair bound, he hoists himself in to his furnace, wearing his prized possession, a medal won from when he was an athlete. He's wrapped up all of his affairs, everything is complete, and he knows he can go, assured the future is both unknown, and yet also complete. He closes the hatch, and incinerates himself. It's incredibly sad, but it's also perfectly fitting. 3. Alien (1979) The Chest-Burster Scene. Whereas the last two death scenes were more emotionally dramatic, this scene from Ridley Scott's 1979 cult classic sci-fi horror Alien Is iconic. If you've read down the list so far, and you have never seen Alien, or at least never been aware of the shocking demise of John Hurt's Executive Officer Kane during dinner, then I'd be mighty surprised. To set the scene briefly, a signal lead the commercial space ship Nostromo to a planet, the crew investigate, and Kane is attacked by a spider-like alien being, which attaches to his face. This later drops off, and Kane recovers. The crew carry on with their travels, deciding to have one last meal before they go. Kane suddenly starts choking, and the crew panic, holding him down, until in a violent final gory death, the alien bursts from out of his rib cage. At this stage in the film, we don't really have any emotional attachment to any of the crew, we don't feel any grief towards Kane. But it's shocking, it's unexpected. At least it was back in 1979. As legend has it, the other actors were aware something was going to happen, but not exactly what. The shock on their faces was genuine during the scene. 2. Blade Runner (1982) Roy Batty. "I've… seen things you people wouldn't believe… Attack ships on fire off the shoulder of Orion. I watched c-beams glitter in the dark near the Tannhäuser Gate. All those… moments… will be lost in time, like [chokes up] tears… in… rain. Time… to die…"
1. 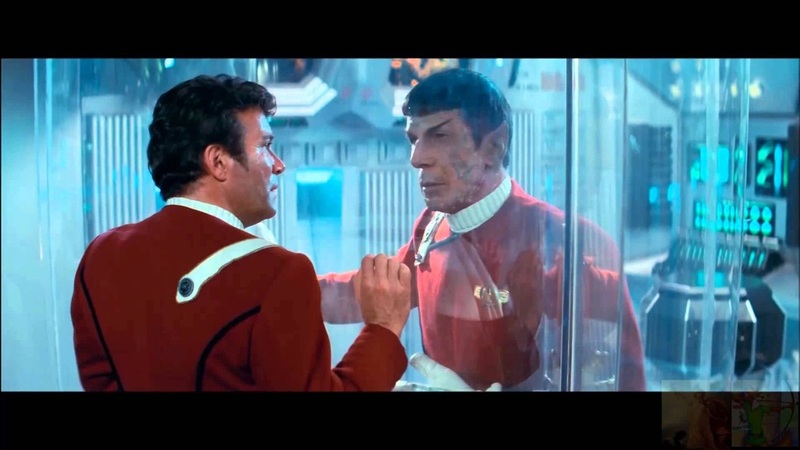 Star Trek II: The Wrath Of Khan (1982) Spock's Sacrifice. Oh my. This is the film that kicked off the list to begin with, the old favourite film that inspired me to write this. Without fear of ridicule, I am, and always have been your friend... Sorry, I mean I am, and always have been a Star Trek fan. 1982 was a golden year for sci-fi movies, along with runner up in this list, Blade Runner, there was also ET: The Extra-Terrestrial, the original Tron, John Carpenter's The Thing (another film I would implore you to watch), Mad Max II, and more. I've not included fantasy films, otherwise we'd have to include Conan The Babarian, The Dark Crystal, and many more. McCoy: [Kirk runs in to the engine room and sees Spock inside the reactor compartment. He rushes over but McCoy and Scotty hold him back] No! You'll flood the whole compartment! Scotty: Sir! He's dead already. Spock: The ship... out of danger? Spock: Or the one. I never took the Kobayashi Maru test until now. What do you think of my solution? Its all the more poignant given the recent death of Leonard Nimoy, who at times struggled to come to terms with his fame related to portraying Spock. But both Nimoy and William Shatner play it for real, and only the most cold of heart would not be moved by it. And there you go. Do agree? Or have other films and death scenes in mind? I could go on all with spectacular special effect laden and gory deaths, but for me, these are the ones that raise the hairs on the back of my neck.